The Goldwise guarantee: Not only will you receive a great price for old gold today – BUT by law we must hold your gold for 14 days before we can use it. If the price of gold is higher on day 14 following the day we purchased your gold, then you will receive an extra payment direct to your bank account (representing the change in our buy price during the 14 day period – a minimum amount applies). And there is no need for you to do anything – you will be paid if the price of gold is higher than on the day you accepted the initial offer. 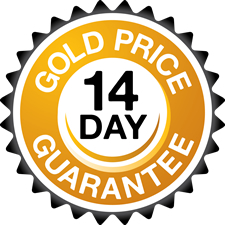 This unique guarantee will give you an opportunity to get even more cash for your gold if the gold price is higher on day 14! Minimum $50.00 price increase applies. Due to administration effort no payout below $50.00 will occur. So what are you waiting for – if you have decided to sell your unwanted gold to Goldwise, simply request a Goldwise Pack here, post your valuables to us and let our professional team do all the hard work! So what if the gold price goes up? Once you have accepted our payout offer, we will wait 14 days and if the gold price goes up, we will re-evaluate your gold and pay the difference based on the movement in our buy price! Having this unique, unprecedented guarantee in place ensures the fairness of the Goldwise process in case the price increases! You won’t need to do anything to take advantage of the Goldwise guarantee – after you have received cash for your gold from Goldwise, you can sit back, relax and let our professional friendly team monitor the gold price in order for them to determine if you are eligible for a higher payout.